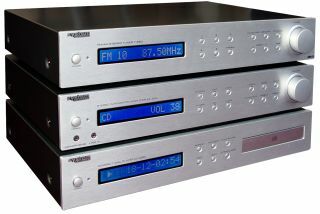 Bristol’s Sound and Vision Show 2008 was chosen for the launch of a new pan-European budget hi-fi brand called System Fidelity. The newcomer was the brainchild of a consortium of European distributors who teamed up with a prominent audio engineer to first launch the brand in Europe in 2004. At Bristol, the company unveiled its new flagship SA-300SE integrated amplifier (£449) and SF-5050 loudspeakers (£549). The amp is a 75-watt wide-bandwidth design with a Class A power supply. It features a sprinkling of audiophile components, too, including ultra-short signal paths and boasts 135-watt dynamic power handling. There’s even an aluminium fascia and remote control. The SF-5050 speakers are said to be highly efficient at 90dB, with a claimed frequency response that extends down to 35Hz. They also benefit from heavyweight curvaceous cabinets and a “unique crossover design”. But for the tightest of budgets, System Fidelity’s new Series 250 components could be the answer. The range comprises a 60-watt integrated amplifier (£179), a CD player (also £179) and an FM tuner priced at £149. These super-budget price points will make System Fidelity a direct rival for the likes of NAD and Cambridge Audio, who currently rule the sub-£200 roost.